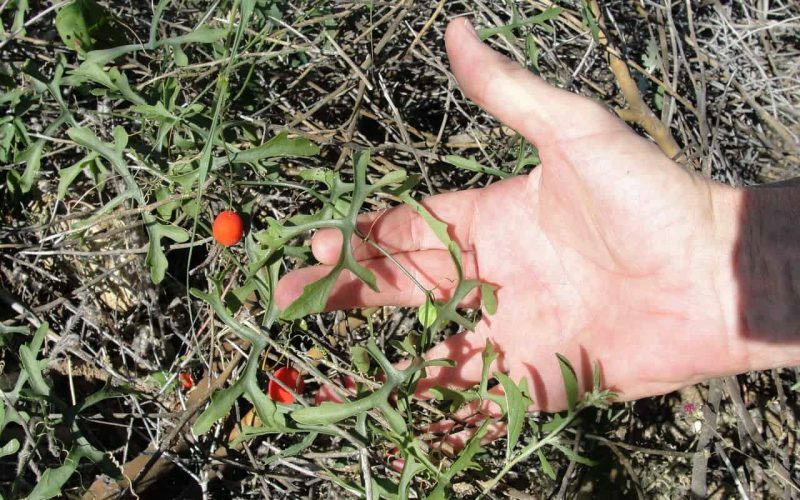 Biologist Frank Reichenbacher points to Tumamoc globeberry (Tumamoca macdougallii Rose), an uncommon vine in the melon and gourd family, growing on the east side of Sabino Creek. Reichenbacher, a volunteer, is the leading expert on this root perennial that in 1986 was only known to grow in a few refuges including Sabino Canyon, the Painted Hills, and Tumamoc Hill and so was listed as an Endangered Species. During decades of scouting Reichenbacher discovered additional populations in southern Arizona and Sonora, Mexico, and in 1993 Tumamoc globeberry was delisted. Today it is a species of conservation concern in the county’s Sonoran Desert Conservation Plan.